One of my acquaintances was not able to sign up online for the German language proficiency test with the Goethe Institute in Frankfurt. At the end of each try, she was told that underage applicants could not register. Go to the Goethe Institute Frankfurt office with a parent. Bring identification with you (for both). Your parent needs to sign the ‘Agreement of Terms’ (German: Einverständniserklärung) at the office. Registration is done there at the office. Payment for the exam can be made by EC Card. If cash only, then the hours for accepting cash payments are: 9:00 – 14:30. If you have any further questions or comments, please share them in the comment section below. If you have read my previous post, then you know what we have been waiting for. 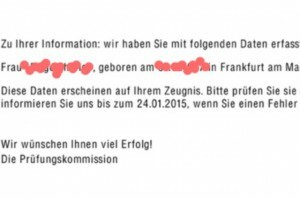 Yes, after four weeks of no communication whatsoever from the institute, we finally got an official Einladung (invitation) for the German language proficiency exam yesterday. We had signed up on 28 December and got it finally confirmed yesterday, on 24 January. As instructed, I read the mail carefully and was advised to notify them of any necessary changes by 24 January, the same day we got the mail. They did not give much of a deadline, did they. Reminds me a bit of the “Hurry up and Wait” principle, only in reverse order. Even if I had discovered a mistake in her online registration, it would be too late now to correct it, based on this mail. On its website, test takers are also advised that if registration and documents did not match, there would be no certificate issued. Wir wünschen Ihnen, liebes G0ethe Institut, auch viel Erfolg! If you are looking for confirmation to your DaF proficiency test registration, check your automatic response carefully. If you see the following words below in your mail, you are in. 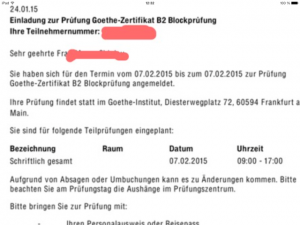 Over the years, I heard from various sources about this lack of written communication between test applicants and the Goethe Institute in Frankfurt, once registration for the test has been made. An outdated IT department sends out automatic responses in German, which clearly need an update. 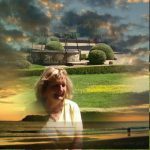 As the test applicants are foreigners, I had wrongly assumed that they had just missed the written confirmation of their registration, or it might have ended up in spam. Not so, it seems. I signed up my daughter on 28 December for the German proficiency test on 7 Feb. In response, I got a standard reply, listing my given data and asking not to reply to this e-mail. Hinweis: Diese E-Mail wurde automatisch erstellt. Bitte antworten Sie nicht auf diese E-Mail. So I contacted the Goethe Institute Frankfurt via private message on its Facebook page four days ago. It seems they have no social media manager, nor page administrator either. In spite of being German, I had a difficult time working my way through this. The registration confirmation procedure definitely needs improvement and a more customer-friendly service. For a euro 200 test-taking fee, I expect more service, such as a clear statement of admission and links to important information. Deutsch als Fremdsprache (DaF) Lernkrimis: reading and listening comprehension practice for level A2 – B1. Each 48-page detective story book comes with an audio CD. Patrick Reich, a private detective, is busy investigating cases in his hometown Kassel. The story includes regional information, definitions and exercises. In my most recent search for an adequate practice test book for the German language proficiency test B2 for one of my students, I found only two books listed as Testbuch (practice test book) versus many more in the category Übungsbuch (workbook) on Amazon.de. Knowing my student would ask me about the meaning of telc Deutsch B2 (see second book), I used the search engine to locate this acronym’s meaning. After about visiting 10 websites listing the acronym, I noticed that none of them gave a proper definition. Anyway, the only website doing it the correct way, was Language Course Finder. But now I have to wonder weather there is a big difference between the above mentioned books. One is to prepare for the Goethe Zertifikat B2, and the other for …telc Deutsch B2. With the European Framework of Reference for Language Learning and Teaching (CEF), recognizing proficiency levels became easier, but not material selection.